Find artworks, auction results, sale prices and pictures of Aiko Miyawaki at auctions worldwide. 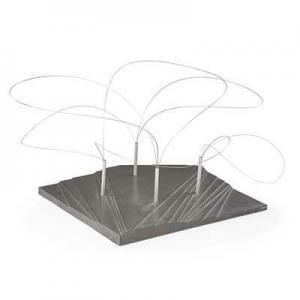 AIKO MIYAWAKI (1929 - 2014) | Rago Auctions Maquette for Utsurohi sculpture for MA-Espace/Temps au Japon exhibition for Festival d'Automne at the MusŽe des Arts DŽcoratifs, Paris, 1978; Lead over particle board, stainless steel; Unmarked; 15" x 15 3/4" x 17 3/4" at base; Provenance: Staempfli Gallery, New York Overall good vintage condition. Several minor dents and some scratches to top surface. Some minor lifting and rippling to lead panels along sides. Miyawaki Aiko PITTURA 13 1929 - 2014 signed in Japanese and English, titled and dated1962 on the reverse oil and marble powder on board 30.5 by 40.5 cm; 12 by 16 in. Provenance Private Collection Mallet Japan, Tokyo, 24 April 2015, lot 152 Acquired from the above sale by the present owner Catalogue Note In the fall of 1962, I spent several hours on a street corner in Paris, watching the sun set, and as it got darker, it had a great effect on me…. I lost all interest in stories which have a beginning, and an end, in bold shapes, bright colors. Then I started to make works that seem to have no beginning, no end. Miyawaki Aiko FleetingIlluminations Born in 1929 in Tokyo, Miyawaki Aiko was an important female Japanese pioneer of abstraction in painting and sculpture who studied under Abe Nobuya and Saito Yoshishige. An ardent traveler, and wife of architect Isozaki Arata, Miyawaki stayed in various places in Europe and the United States in the 1950s and 1960s, forging important friendships with artists such as Man Ray, Piero Manzoni, Lucio Fontana and Marcel Duchamp. 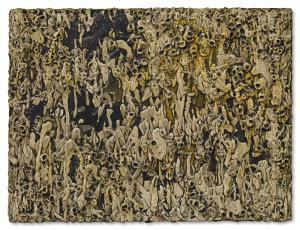 The present work was created in 1962 – a period when Miyawaki stayed in Paris under contract with Andre Scholler. During this period, Miyawaki became firm friends with Man Ray and his wife, and also had her portrait taken by the photographer. Miyawaki\’s mixed media two-dimensional abstract works tend often towards the sculptural, and include diverse materials such as brass, stone, marble and glass, whilst always exuding a distinctive aura of tranquility and a soft sensitivity. As Hayashi Michio observes, Miyawaki\’s art always reveals a \“tension between transformations and a something that remains unchanging\”. Commenting on the artist\’s 1960s works in particular, which contain subtly undulating surfaces in the mixture of paint and powder, Hayashi detects inherent \“moment-to-moment variations\” in the works that change \“according to the changes in illumination and in the viewer\’s position\”. Per Hayashi, while Miyawaki\’s works from this period may recall the monochrome paintings of Agnes Martin and Robert Ryman, the Japanese artist\’s art is characterized by a singular sculptural sensation rather than by brushwork. Starting from 1966 Miyawaki devoted her oeuvre primarily to sculpture, and her internationally acclaimed work has been exhibited at institutions across the world, such as the Cooper‐Hewitt Museum, the Smithsonian Institution's National Museum of Design, The Museum of Modern Art, Kamakura & Hayama, The National Museum of Art, Osaka, Nagi Museum of Contemporary Art andMuseum Haus Kasuya. 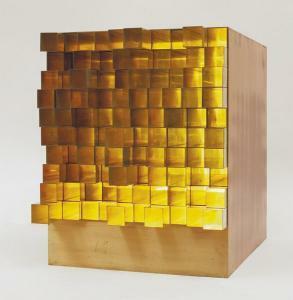 Brass, mirrored glass. 48 x 38 x 45 cm. (19 x 15 1/8 x 17 3/4 in). 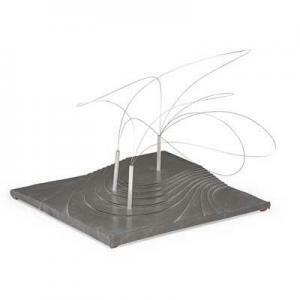 AIKO MIYAWAKI (1929 - 2014) | Rago Auctions Maquette for Utsurohi sculpture for MA-Espace/Temps au Japon exhibition for Festival d'Automne at the MusŽe des Arts DŽcoratifs, Paris, 1978; Lead over particle board, stainless steel; Unmarked; 12 1/2" x 17 3/4" x 16" at base; Provenance: Staempfli Gallery, New York Overall good vintage condition. Several minor dents to top surface. Light to moderate wear and some minor lifting to lead coating along sides.